The Bundle Plan allows Inmarsat Isatphone Pro users to use their satellite phone everywhere on earth, including the United States. Includes 30 minutes per month. The Standard Plan allows Inmarsat Isatphone Pro users to use their satellite phone everywhere on earth, including the United States. - Monthly subscriptions are pro-rata for month of activation, monthly in advance, & based on a full billing month at deactivation. - Usage Alerts***: We can notify you / suspend if a SIM uses more than a specified amount of airtime (MBs or Minutes) and / or a specified amount of dollars spent per month. This map is illustrative of IsatPhone coverage. It does not provide a guarantee of the extent of service ability. 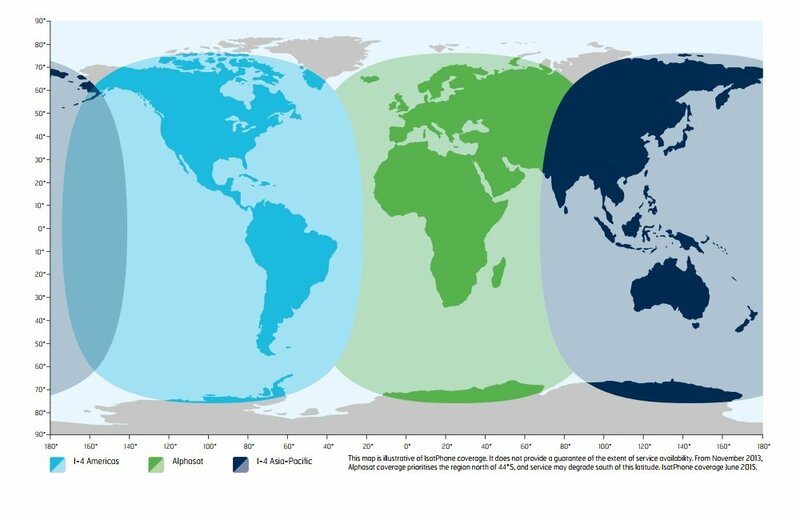 From November 2013, Alphasat coverage prioritizes the refion north of 44.5 degrees South, and may degrade south of this latitude. Isatphone coverage June 2015. I have a Global Star 1700 phone. Will it work with this plan? All satellite phone providers offer plans which only work with their own hardware. This plan will only work with the Inmarsat Isatphone.